Artist's impression of the Wyre tidal barrage scheme, with the large ferry vessel indicating scale. 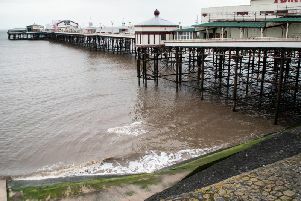 There has been a further boost to Fleetwood’s £400 million tidal barrage plans after a billionaire bought a stake in the project. Work on the Wyre Tidal Gateway scheme looks set to take a major leap forward with news of billionaire steel magnate Savjeev Gupta is investing in Atlantis Resources, the company which has been leading the scheme since last year. Billionaire industrialist Sanjeev Gupta has bought a 49 per cent stake in the company behind the Wyre Barrage project at Fleetwood. The Gupta organisation has also recently concluded a deal with Fleetwood based company Natural Energy Wyre Ltd (NEW), which is a partner on the barrage project with Atlantis. Mr Gupta’s involvement sees a deal struck with his company Simec, to create a powerful new renewable energy organisation, Atlantis SIMEC Energy. Fleetwood man Bob Long, of CEO of NEW, who says the tidal energy scheme will regenerate the town, has welcomed the creation of the new company which will advance the barrage scheme still further. Mr Long said this week: “We are very fortunate to have attracted first the attention of Atlantis Resources and now the deal with “Simec” is the icing on the cake. “This now means that the project is additionally strengthened by the “Gupta-billions”. Edinburgh-based tidal power company Atlantis came on board with the Wyre scheme in May last year. It will now be transformed into a diversified renewable energy business, while the transaction for amajor stake is billionaire Gupta’s first move into the stock market. The reverse takeover will see Atlantis acquire Simec’s 220 megawatt Uskmouth plant in South Wales which will be converted to use an end-of-waste energy pellet as fuel. Simec, in return, will get a massive 49.99% stake in Atlantis and its portfolio of tidal stream and barrage projects - including the Wyre estuary project in Fleetwood - as well as international opportunities in Europe, Asia and North America. Mr Long CEO and Tim Cornelius CEO of Atlantis SIMEC Energy met in London last Friday to agree essential terms allowing progress of the Fleetwood project. The Wyre barrage will be 10m wide and 370m long, housing eight 27ft turbines, four sluice gates and two locks at the mouth of the river. Atlantis plans to build a visitor centre alongside the barrage, which has an expected lifespan of more than 125 years. It is expected that it will take three years to get all the consents needed to start building. Once construction starts, the barrage will take three years to complete and is expected to be operational by early 2023. Indian-born Mr Gupta is the founder and executive chairman of the Liberty House Group, an industrial and metals company founded in the UK in 1992 which has a turnover of nearly $7 billion, and runs a portfolio of other companies.